What characteristics of the serpent should we adopt as followers of Christ? Serpents are indeed wise creatures. So wise and prudent in fact, that, according to the bible, Satan made use of a serpent to deceive our first parents: "The serpent was more subtle than any beast of the field" Genesis 3:1. 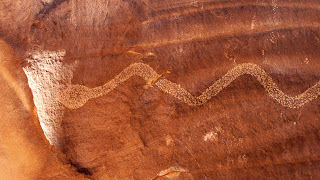 Solstice Snake petroglyph, Moab, UT. Like many snake petroglyphs, this one has 13 bends. On the day of the summer solstice, a shaft of sunlight makes this arrowhead of light appear on the head of the Solstice Snake petroglyph. The serpent's chief concern in a confrontation is to defend its head. A blow to the head could be deadly or paralyzing, even temporarily, and for the most part a snakes only defense are its fangs. Likewise, our chief concern should be to defend our heads from error, anger, and cruelty. If our minds are tainted with false doctrines, anger, jealousy, or impurity we will be lead into sin and fall prey to our enemies. ...see that all these things are done in wisdom and order; for it is not requisite that a man should run faster than he has strength. And again, it is expedient that he should be diligent, that thereby he might win the prize; therefore, all things must be done in order.